2. 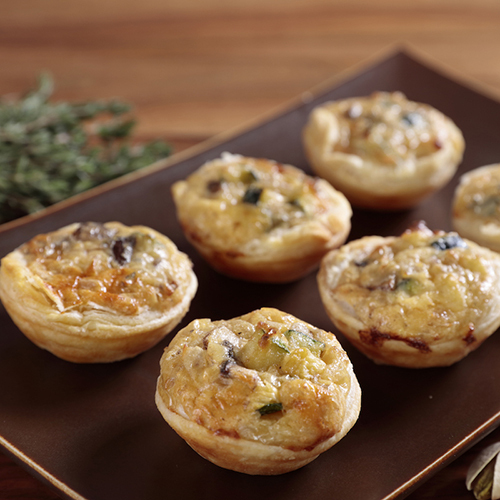 Unroll the pastry and cut out circles to sit comfortably in your muffin tins. Line the muffin tins with the pastry circles and bake blind for 5 minutes. Sauté the onion, courgette and mushrooms until softened. Transfer to a mixing bowl before adding the egg, herbs and grated Applewood®. Season to taste. Mix the filling well and spoon into the part-baked pastry cases. Return to the oven and bake for 15 minutes until golden.Cool before removing from the muffin tin. Great for picnic, snack or even as a healthy lunch box addition for the kids.